Pancakes seem like a pretty basic recipe to memorize—the one thing a nomadic Beat poet would know how to make. 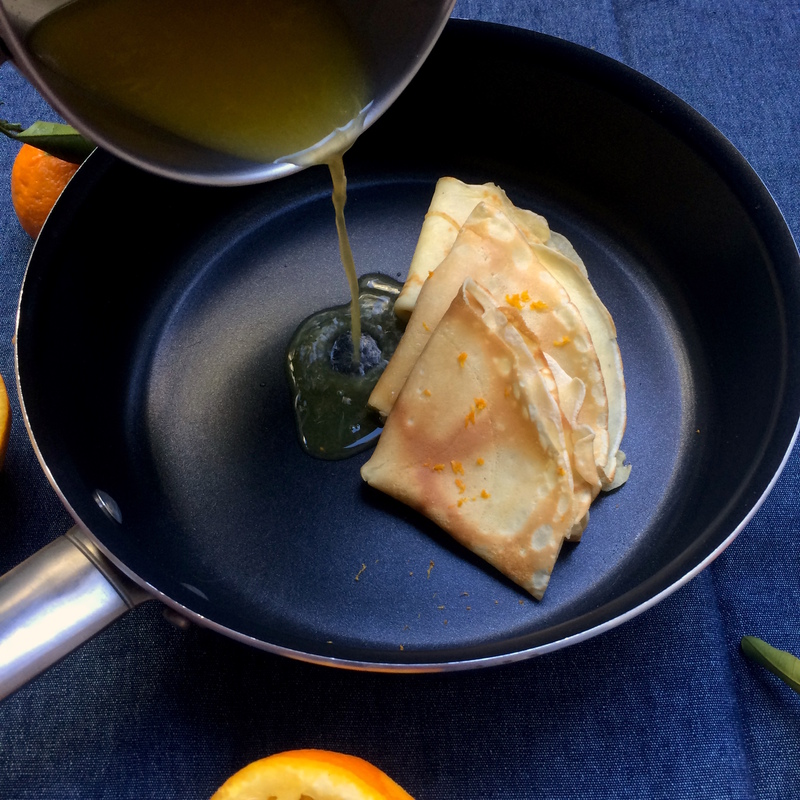 But crêpes suzette adds a little flare … or more than a little, depending on your flambeeing skills. While the batter is simple, the Grand Marnier-spiked sauce is traditionally set alight tableside, so your guests’ eyebrows might get a little singed if your flame isn’t under control. 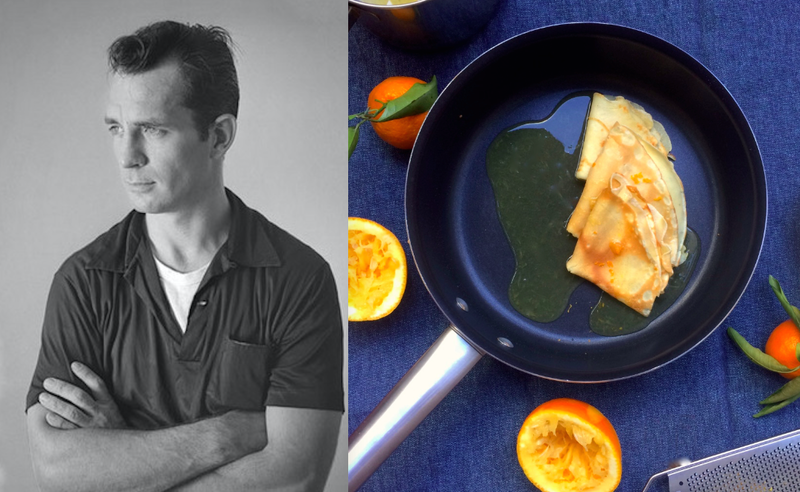 It seems classically Kerouacian to introduce a little bit of the experimental to the pedestrian world of pancakes; this is a guy whose food diary for a day read “crêpes; weed.” I’m a little more timid, so this version that keeps the fire in the kitchen works well for me. Practice it a few times, and it’ll be in your back pocket soon enough. Combine flour, eggs, milk, melted butter and sugar in a medium bowl; mix well with a whisk. Add the water and oil and stir well to combine, breaking up any lumps. Heat a buttered crêpe pan or skillet, preferably nonstick, over medium heat. Pour about 3 tablespoons of the batter into one side of the skillet and immediately tilt it, shaking it at the same time, to make the Batter run all over the bottom. Cook over medium-high heat for about 1 minute, until browned. Flip and cook for about 30 seconds on the other side and transfer to a plate. Repeat with remaining batter. In a food processor, combine the softened butter, sugar and orange zest. Add 2 tablespoons orange juice in a steady stream until incorporated. Spread the butter on each crêpe. Fold in half, then in half again to form triangles. Place back in the crêpe pan. In a small saucepan, heat the cognac, Grand Marnier and remaining 2 tablespoons orange juice. With a long-handled match, ignite the mixture carefully and pour over the platter. Tilt the platter and, with a spoon, carefully baste the crêpes until the flames subside. Keruak. It’s a lovely piece. I only have to make a recipe a couple of times before I know memorise it. Thanks for sharing the history behind this recipe, I love recipes that have a cool story behind it. I’ve never flambeed anything really, though I did make a fireball (on purpose) at a Thai cooking class. I am a 16-year-old foodie who has been following your blog for a while, and it is awesome! Also, is it me or does he look a bit like Ewan McGregor with a picture of him in his youth up there? Seriously, he really does. And mmmm…these look really delicious! Have you ever read the book “Hothouse” by Boris Kachka? It’s about the New York publishing biz mainly in the 20th century, as told through the story of that literary giant powerhouse, “Farrar, Straus, and Giroux”? It’s really fascinating, and I highly recommend it. It’s a bit gossipy, but well-researched and well-written.